Ottis Jerome "O.J." Anderson (born January 19, 1957) is a former American football running back who played professionally in the National Football League (NFL). He was named the NFL Offensive Rookie of the Year by the Associated Press (AP) with the St. Louis Cardinals in 1979, and the MVP of Super Bowl XXV in 1991 when playing with the New York Giants. He played college football at the University of Miami. Anderson was born and raised in West Palm Beach, Florida. He was a football and track star at Forest Hill High School in West Palm Beach, Florida before graduating in 1975. He went on to attend the University of Miami on a full athletic scholarship and earned a degree in Physical Education. During his college career, Anderson broke Chuck Foreman's career rushing records at the University of Miami, becoming the first player to rush for more than 1,000 yards in the school's history his senior year with 1,266 yards. He was named The Sporting News and the American Football Coaches First Team All-American and received All-American honorable mentions by both AP and UPI and graduated in 1979 as the team's all-time leading rusher with 3,331 yards. Anderson was selected in the first round of the 1979 NFL Draft, the 8th overall pick, by the St. Louis Cardinals. He had what was probably the greatest debut game in NFL history when he rushed for 193 yards. His single season 1,605 rushing yard performance was one of the few bright spots in the Cardinals' 1979 season, when they finished 5-11. He earned the first of back-to-back Pro Bowl selections that year. In his first six seasons, Anderson rushed for over 1,000 yards in five seasons. The lone exception was in the 1982 strike-shortened season, when he rushed for 587 yards in eight games; a pace for well over 1,000 yards in a full 16 game season. The Cardinals made the playoffs in 1982, thanks to an expanded field due to the brevity of the season. It was the franchise's first postseason appearance since 1975 and last until 1998. Anderson rushed for 58 yards on eight carries against the Green Bay Packers in the team's lone playoff game. Injuries drastically decreased the number of games Anderson played each season, and his explosiveness as a tailback. After a year and a half, Stump Mitchell emerged as the Cards' top running back, and the expendable Anderson was traded to the New York Giants in the middle of the 1986 season. He ended up deep in the Giants' depth chart. By this time in his career, it was clear that he was better used in goal line or short yardage situations. 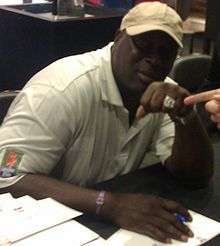 Anderson would rush for only six yards on seven carries in the 1986 playoffs, but did score a rushing touchdown in the Giants' victory over the Denver Broncos in Super Bowl XXI. In his first two and a half seasons with New York, Anderson did not fumble once in his 100 offensive touches. In 1989, Anderson become the top running back for Bill Parcells' ball control offense and was named NFL Comeback Player of the Year. He scored a career high 14 rushing touchdowns, and rushed for 1,023 yards on 325 carries. He was also the top running back for the Giants the following year, when they won Super Bowl XXV, and was named Super Bowl MVP for his 102 yards and a touchdown on 21 carries. As a testament to the Giants' ball control strategy, their time of possession was double that of the Buffalo Bills, their opponents, in the first Super Bowl without a turnover. Anderson is one of only four running backs in NFL history to score rushing touchdowns in two Super Bowls and win Super Bowl MVP (only Franco Harris and John Riggins accomplished this feat before Anderson, and only Emmitt Smith has achieved it since). Anderson was replaced by Rodney Hampton in 1991. His last season was 1992. Anderson fumbled just three times in 739 touches as a Giant, from 1987–1992. When he retired, Anderson ranked seventh in rushing TDs and eighth in rushing yards. At the 2014 season, Anderson was ranked 18th in career rushing touchdowns and is one of 29 running backs in the history of the NFL to rush for more than 10,000 yards (currently ranked 26th in career rushing yards). The end of Anderson's 14-year football career in 1993 marked the beginning of his career in entrepreneurship and motivational speaking. Anderson has appeared on several major local and national radio and television shows, including the David Letterman Show and Good Morning America. He has experience as a broadcast analyst with WFAN for the New York Giants, and has co-hosted three radio shows in St. Louis with former Cardinal teammates Theotis Brown, E.J. Junior and Roy Green respectively. Anderson was also a frequent guest on The Billy Taylor Show in New York City and contributed to an in-season weekly column, "Ask Ottis", in the Giants Insider publication. As president of Ottis J. Anderson Enterprises, Anderson is also involved in several ventures and is involved with writing benefits for municipalities, school boards and privately held businesses in New Jersey. Anderson has been affiliated with many community organizations such as the United Way of America, Boys & Girls Clubs of America, National Multiple Sclerosis Society, The Breast Cancer Research Foundation, and the Deborah Hospital Foundation. Anderson is a member of Omega Psi Phi fraternity. Chris Cuomo of ABC News interviewed Anderson as part of One Moment in Time: The Life of Whitney Houston, a two-hour special on ABC shortly after the death of singer Whitney Houston. In Super Bowl XXV, Houston performed "The Star-Spangled Banner", and Anderson and then-Giants quarterback Jeff Hostetler reflected on Houston's performance in that game. Anderson appeared on Comedy Central's Tosh.0 during the Crying Giants' Fan Web Redemption. Anderson has endorsed Global Syn-Turf, Inc. synthetic turf for sports fields. 1 2 3 4 "Biography on Ottis Anderson's official site". Retrieved 2010-09-09. ↑ "NFL First Game Records". goldenrankings.com. Retrieved 7 August 2013. 1 2 3 "Profile on NFL's official site". nfl.com. Retrieved 2010-09-09.